Beans and pulses should ideally be on every shopping list you make. They're economical nutritious and filling so they make perfect student food. They're particularly good for vegetarians as they provide protein, which makes them a good meat alternative. 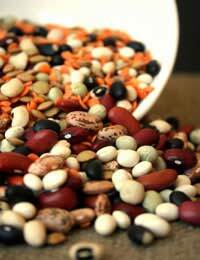 With regards to cooking, there are various ways to cook different varieties of beans and pulses. As a general rule, you can buy them dried or canned and the canned variety are already soaked so just need heating through, or you can eat them directly from the can (well, maybe not literally!). Both options have a very long shelf life so they're great store-cupboard essentials. There's nothing very complicated about preparing dried pulses; you just need to be a little more organised as some varieties will require overnight soaking. There are many different types of lentils and they're a great staple for adding to soups and casseroles. They add bulk, flavour and texture to dishes and they are used extensively in cuisines around the world. Dried varieties will need soaking before use but that just means putting the required amount in a bowl of water and allowing them to rehydrate. Red lentils are delicious added to soups and stews and they can also be used to make a spicy Indian dhal. Puy lentils make a lovely, earthy accompaniment to chicken dishes. This delicious pulse has a lovely nutty flavour and can hold its own as the main ingredient in a vegetable curry or as an addition to a casserole or soup. Again, you can buy chickpeas dried or canned and it's really up to you, which you choose. A can of chickpeas can be rinsed, drained, mixed with a can of tuna and some chopped red onion, red pepper and parsley and turned into a wonderfully fresh, summer lunch in a matter of minutes. Alternatively, why not try making your own fresh hummus? Rinse and drain 1 x 425g can of chickpeas. Place in a food processor bowl and add the juice of _ lemon, 2 finely chopped garlic cloves, a dash of water, a pinch of cumin and a large pinch of salt. Process until smooth, then keep the motor running as you slowly add 4 tbsp extra virgin olive oil. Taste and add more salt if required, or a little more olive oil, if the paste is still stiff. Serve in a bowl with some warmed pitta bread or crudités for dipping. So named because of their kidney shape, these shiny deep-red beans are probably best known for the role they play in chilli recipes. However, you should try them in other dishes as well. They make a great salad when combined with other beans such as chickpeas or borlotti beans. Just add some freshly chopped herbs and a little fresh chilli for a bit of a kick. Drizzle with olive oil and serve with warm, crusty bread. As with other pulses, kidney beans are a great veggie staple and can be added to stews and casseroles as they retain their shape and add a depth of flavour. Try experimenting with beans and pulses that you haven't tried before. Just read the cooking instructions on the packaging if you're not sure about preparation and you might discover some new store-cupboard favourites!